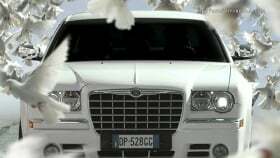 A similar version of this Chrysler 300 ad, using Lancias, aired in Europe last month. Chrysler, like its new sister brand Lancia did last month, is using an ad for its 300 sedan to advocate for the release of imprisoned Nobel laureate Aung San Suu Kyi. The video delivers on Chrysler brand chief Olivier Francois' promise that he won't copy other car companies' marketing styles in his attempt to revive and reposition the brand. The ad debuts today on Bloomberg Television, FOX News and the Chrysler brand's Web site. It shows black Chrysler 300s escorting Nobel Peace Prize winners to the 10th World Summit of Nobel Peace Laureates last month in Berlin. The last 300 to arrive, a white one, is empty. It symbolizes the ongoing house arrest of Suu Kyi, the 1991 Nobel peace laureate who advocates for democracy in military-run Myanmar, formerly known as Burma. “This film is dedicated to Aung San Suu Kyi, still prisoner in Burma,” the narrator says. A similar version of the ad, using Lancias, aired in Europe last month after the summit, which the Italian brand sponsored for the second straight year. The Chrysler marketing campaign includes an opportunity for visitors to the Chrysler Web site to replace their Facebook profile photo with a picture of Suu Kyi. Francois became the Chrysler brand's leader as part of Chrysler Group's post-bankruptcy takeover this spring by Italian automaker Fiat S.p.A. Francois, head of marketing for all of Chrysler Group, continues as chief of Fiat's Lancia brand. At Chrysler's eight-plus-hour presentation of its five-year plan last month, Francois explained plans to position Chrysler as a high-fashion, luxury brand. He showed a brand video that redefined Chrysler by using models with plunging necklines, long legs and French kissing. “Let's design cars people want to make out in again, cars people want their pictures taken in,” the narrator said. In the past, Francois has made Lancia Musa minivan commercials with the French first lady, model Carla Bruni. He also featured actor Richard Gere in a Tibet-friendly Lancia Delta commercial broadcast during the opening ceremonies of the Beijing Olympics, a spot that led Fiat CEO Sergio Marchionne to apologize to China's government.